Happy Meal and I had a Groupon for The Bucket burning a hole in our collective pocket, and traffic was light on the Sunday afternoon of this review. I think everyone was watching the Raiders get destroyed by the Patriots. I know that was what was happening at The Bucket. Half of the crowd on the loud patio of the sports bar was composed of Raiders fans, and the other half was families with kids. We were lucky to arrive near the end of the 4th quarter as the fans of the losing team were wrapping things up. Free parking was easy enough to find in the attached lot. The Bucket's menu was strictly burgers and wings. The Bucket was celebrating its 76th year of operation. It was a typical, LA burger stand. There were a handful of counter seats near a sweltering grill, and there was a collection of tables in an enclosed patio area with some TVs. I had Happy Meal stake out a table, and I ordered a couple of cheeseburgers, fries, and some canned soft drinks. This set us back $10 (Groupon). Our burgers arrived in about 20 minutes. The Beef: The Bucket used a pretty average tasting Chuck for their cheeseburgers. The beef was mildly beefy. It had no trace of aging. The fat content was about 20%. The beef was moderately juicy. This was perfectly average burger meat. The Seasoning: I tasted a very faint amount of seasoning, but it was not nearly enough to complement the mild beef flavor of the burger patty. 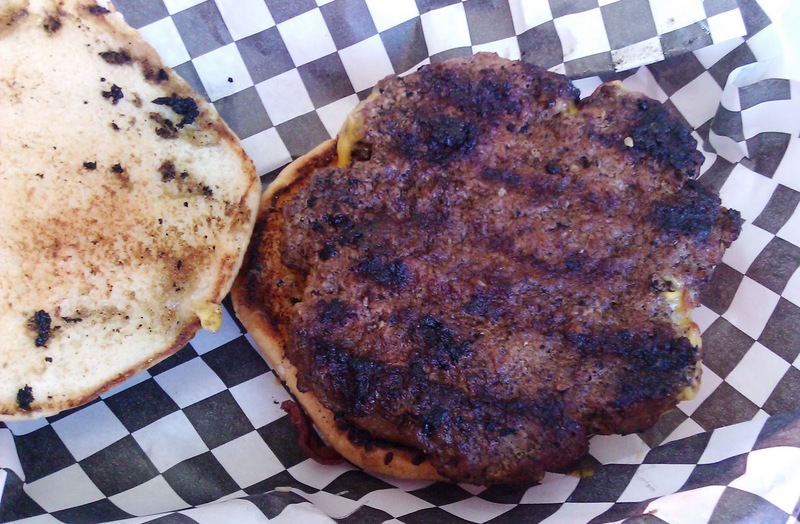 The Sear: The Bucket got a decent looking sear onto the burger patties, but it was neither deep nor crisp. The sear was cosmetic only. 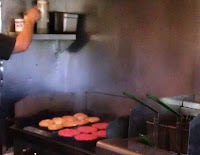 The Preparation: The Bucket cooked their burgers on a very small gas grill (6 patties at a time), and they toasted the burger buns on the attached griddle. Burgers at The Bucket came out Well Done. It was safe to assume that the burger meat arrived pre-ground. The 1/2 pound Chuck patties were thick, and they were packed loosely enough. The bite was firm but not rubbery. The Cheese: The Bucket offered two cheese choices...Monterey Jack and American. We went with American. The cheese was fine, and it was properly melted. 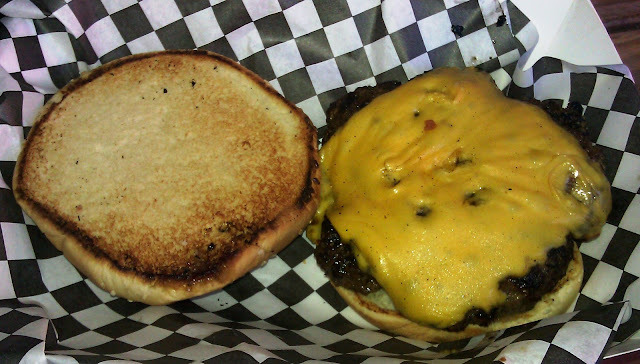 Unfortunately, the single slice was lost in the 8-ounce patty, so the cheese was largely invisible to the palate. The Bun: The generic, seeded burger bun was moist, fresh, and toasted. It was mild to the point of contributing no substantive flavor to the dish. While the bun was toasted, it was not crisp, so there was no crunch from the bun. The Fries: The Bucket used frozen, par-cooked, crinkle cut fries. 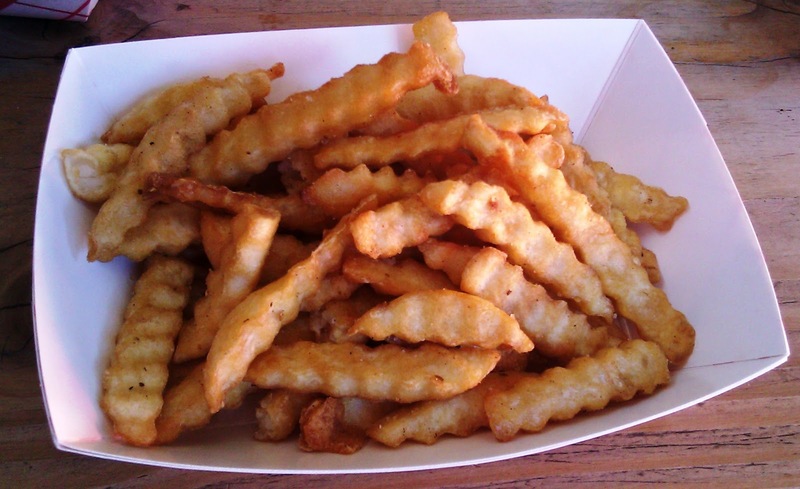 The fries were cooked to a crisp golden brown, and they were properly seasoned. Then the fries sat around for about 20 minutes. The fries came out luke warm, so the interiors were on the mealy side. The Toppings: The tomato slice was surprisingly fresh and juicy. The dill pickle chips were refreshingly spicy. The Romaine lettuce leaf was crisp and fresh. The Value: We only paid $14 for our meal...$10 Groupon and a $4 tip. That was about what it was worth. I would have been bummed out if I had paid the menu price of $7.50 for each burger. Fries...$3.00 per serving--ouch. Canned soda...$2.00 each. The value at $10 was fine, but at the $24 that we would have paid for full menu price, the value would have been............discouraging. The Bucket served up a perfectly average burger. It was big and bland, but it was filling. 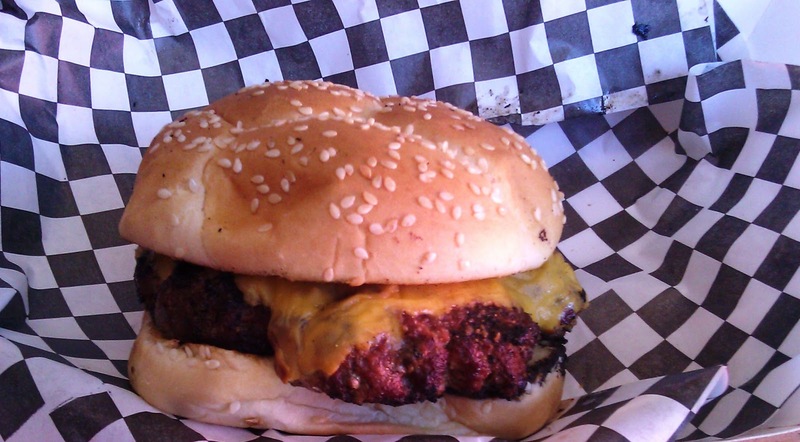 Burger Review : Big, average burgers at premium prices.